Russian engineers are scrambling to save the Phobos-Grunt spacecraft amid ever-bleaker signs the mission may be lost. The probe was launched uneventfully Nov. 8, but soon afterward its thruster failed to fire to send it on a course toward Mars, leaving the spacecraft stranded in Earth orbit. Phobos-Grunt was designed for an ambitious mission to retrieve samples from Mars' moon Phobos, and return them to Earth, though it was also carrying a small payload from the Planetary Society, a nonprofit space advocacy group, to test the effects of microgravity on tiny organisms. Here David Warmflash, the science lead for the U.S. team of the payload, called the Phobos Living Interplanetary Flight Experiment, shares his thoughts on how the mission might be saved and what it feels like to have a spacecraft on the edge. Back in 2003, I spearheaded a Planetary Society-sponsored project that on the surface was a space microbiology study, yet which came to be known as the "Peace Experiment." The project flew on the space shuttle Columbia's ill-fated STS-107 flight. Given a last-minute opportunity to fly anything on what was to be a space shuttle mission devoted entirely to science, I had proposed to then-Planetary Society executive director Lou Friedman, and director of projects, Bruce Betts, that we seize the moment to get Israeli and Palestinian students working together in the name of science and space exploration. Given the short amount of time available at that point, we all knew that any new experiment must be limited in terms of its scientific sophistication, but Lou and Bruce agreed with me that there was an unprecedented opportunity to teach the world one of the ideas that the late Carl Sagan, Planetary Society founder, used to promote: that science and space travel help us to realize that our similarities as human beings curious about the cosmos outweigh national, ethnic and political differences. As science lead for the U.S. team of the Planetary Society's Phobos Living Interplanetary Flight Experiment (Phobos LIFE), I live by this idea, as does the entire project team. My colleagues at the Planetary Society, and at the nonprofit biological resource center American Type Culture Collection (ATCC) in Virginia, and I are American scientists involved in an experiment on a space probe of Russia, a nation that once was our archenemy. But the international nature of Phobos-LIFE goes beyond this, involving colleagues in Germany and Sweden playing a central role in the experiment. If that's not enough, Russia is not merely carrying the biomodule in which our organisms are packaged, but Russian microbiologists have contributed a mixed population of microbes contained in a soil sample. And by the way, the soil is not from Russia, but from the Negev desert, in Israel. Returning from space on the morning of Feb. 1, 2001, the shuttle Columbia broke apart, killing the seven astronauts who had ascended to orbit for the sole purpose of tending and operating a plethora of experiments, including our tiny one, though ours had required only a few knobs to be pulled or turned at a certain point in the flight. Many of the other experiments were more sophisticated and developed with a great deal more thought and time. For two weeks, we had a lot of fun doing interviews, talking science, and getting our Palestinian student, Tariq Adwan, and our Israeli student, Yuval Landau, as much media coverage as could be obtained. Unlike the unpiloted Phobos-Grunt mission whose fate now hangs in the balance, however, the crisis of the Columbia developed very quickly. Waiting with two friends and colleagues (not the students, as we could not get them permission to enter the Kennedy Space Center in Florida, where the shuttle launched and was slated to land) along the runway where the shuttle was to touch down, we failed to hear the usual sonic boom that signals that the returning orbiter is approaching. It did not take more than a minute or two before the reality of what had happened set in. Perhaps, for 10 or 20 seconds, we speculated that the shuttle might have fired its rockets a little early or late and thus performed an emergency landing in New Mexico, or even Australia, but then we got phone calls from people at home watching television, and that was it. Seven people were dead, and there was no chance that anything good was going to come out of the disaster. Flash forward to 2011. Earlier this year, we actually sent a precursor experiment, Shuttle-LIFE, into space on the final flight of the Endeavour orbiter, which was flawless. That was nearly three days ago, and since then, based on the scant information that has come out, the Russian Federal Space Agency, Roscosmos, seems to be focusing efforts on re-establishing communication with the probe, testing its orientation with respect to the sun so that its batteries can charge, and diagnosing the reason for the failure of the Fregat engines to ignite. If the Fregat engines cannot be started, latest word from Russian authorities predicts that Grunt will re-enter the atmosphere on Dec. 3. Unconfirmed sources in Russia have suggested, very pessimistically, that if controllers cannot communicate with the probe very soon, then all is lost. But the time frame from now to then actually leaves a lot of time, not only for recovery efforts, but also for strokes of genius — much more time than was available for, say, the troubled-but-ultimately-saved Apollo 13 mission. The fact that there are no astronauts on this mission means that the type and level of concern is going to be very different compared with flights of piloted craft. As I write this, late Thursday afternoon (Nov. 10), there are dozens of articles floating around, numerous blogs, and thousands of tweets all expressing similar fears of a worst-case scenario in which the Phobos-Grunt spacecraft and its entire 12-ton load of toxic fuel comes down on a populated area two weeks from now. However, as far as I can tell, the likelihood of such a scenario is not substantiated by any credible source. Should the entire spacecraft come down, experts are saying that, most likely, the fuel would burn up high in the atmosphere. Yes, there is concern that after enough time in space the fuel might freeze and thus make it to the ground, a potential environmental disaster, but that scenario is built upon several "ifs." Taking all of this into account, I'm compelled to focus my concerns on all of the work that will have been performed by so many dedicated people to get this mission into space, and all of the science that will have been lost. Weighing just 88 grams, our LIFE biomodule is just a minute amount of Grunt's payload, let alone the 13 or so tons of its total mass. The experiment cost about $500,000 to develop, a small sum in comparison to the many millions of dollars that went into the Phobos-Grunt mission as a whole. Mounted within the capsule into which 200 grams of surface material from Phobos is to be deposited for a flight back to Earth, the biomodule is passive, not requiring any care during the expected 34 months of the mission. Other components of the science payload include an extensive instrument package designed to remain on Phobos after an upper-stage rocket launches the return capsule with the surface sample and our biomodule back toward Earth. Also piggybacking on Phobos-Grunt is China's Yinghuo-1 probe, which is to orbit Mars. 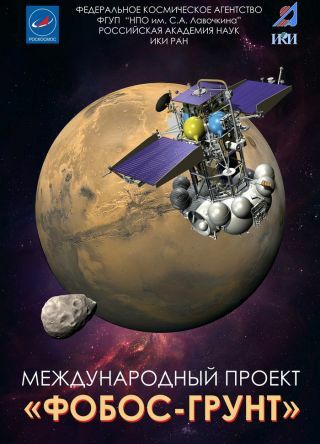 This Russian-language infographic from Russia's Federal Space Agency depicts the different phases of flight, landing, sample gathering and return for Russia's Phobos-Grunt mission to the Mars moon Phobos launching in Nov. 2011. Currently, Roscosmos officials are focused on communicating with the spacecraft, as they must be, if it is to do anything other than crash. Being on the science team, however, out of contact with the people who are controlling the mission, it is tempting to consider how some of the science intended for the mission might be salvaged, in the event that the Roscosmos controllers succeed in recovering the spacecraft, but only partially. What does partial recovery mean? It could mean they gain control of the spacecraft systems and can fire the engines, but after the orbit around Earth has dropped so low that there is not enough fuel to go to Phobos. Or, it could mean that they gain control of the spacecraft, but that the Fregat engine still will not ignite, yet the much less powerful propulsion units designed to land the craft on Phobos and propel the return capsule back to Earth are working fine. What then? Thinking about this in the context of Apollo 13, I'm wondering what could be done to prevent some or all of the science payload from re-entering the atmosphere. After an explosion in Apollo 13's service module cut off propulsion and power, the lunar excursion module (LEM) was used as a lifeboat to provide life support to the three astronauts, and the engine of its descent stage for course changes, until the command module could re-enter the atmosphere after a long coast around the moon. Without the Fregat upper stage, Grunt cannot travel to Phobos, yet if this powerful and massive stage were jettisoned, some less powerful, but functional, engines would be available for burns. Would this be enough to send any of the components to a higher orbit? Probably a more important question for you at this point is, "What would be the point of that?" Well, maybe the Chinese Yinghuo-1 could do something scientifically useful in Earth orbit, and maybe the equipment that is designed to stay on the Phobosian surface could be useful. Then, there is the LIFE biomodule, which we piggybacked in the Grunt mission simply to get it into interplanetary space for as long as possible, 34 months in the case of this mission. By interplanetary space, we are talking about an environment in which space radiation is much more intense than it is in LEO, because above Earth orbit is the geomagnetosphere, the Van Allen belts, which trap charged particle radiation coming from deep space. There is an inner belt, extending from about 100 to 10,000 kilometers high, and an outer belt extending from 13,000 to 60,000 kilometers altitude. Apollo 16 and Apollo 17 carried biology experiments known as Biostacks 1 and 2 beyond these belts (the moon is about 400,000 kilometers away). This was only for several days, however, for each mission, while most of the other tests of the survival of organisms in space have taken place in LEO. The LIFE experiment, exploded view. Since the Russians offered us the opportunity to take 10 biological species far beyond the geomagnetosphere by going to Phobos and back, we knew that we had an unprecedented opportunity to test whether organisms can survive for nearly three years in the interplanetary space environment. To meet the objectives of Phobos LIFE, however, the return capsule, where the biomodule is mounted, actually would only need to fly beyond the radiation belts. Consequently, it is tempting to think of a sort of consolation mission for Grunt, based on the idea of boosting the return capsule to an orbit with an altitude of 60,000 kilometers or more. Then after a few years the capsule could be allowed to return to Earth as it was supposed to do on the way back from Phobos. Or, maybe they could even leave it up for five or 10 years until it could be recovered another way. Since we're looking at the ability of microbes to withstand space, the longer the better. I don't know if it is possible, nor how Roscosmos would feel about repurposing the mission, and of course I'm hoping for the best, because I'm nearly as excited about the Phobos sample return as I am about our much smaller experiment. Nevertheless, should it turn out that control is restored, but the craft cannot get to Phobos due to fuel or engine issues, trying to salvage the science payload seems a whole lot better than allowing it to burn up with the fuel on re-entry.